I love thread! Thread comes in such a wide variety of colors, weights, shines and shapes of spools. Lately I have been doing a lot of playing with heavier weight threads in my machine and have been very impressed with the outcome and look that I get from quilting with the heavier weight threads. One of my favorites is Sulky 12 weight cotton thread. There are some things that you do need to be aware of when working with heavier weight thread and I’m going to share 4 tips for quilting with Sulky 12 weight thread today. Yesterday I finished up the quilted scissor holder and I used the 12 weight Sulky thread to sew on the buttons. This thread is made of a long staple, highly mercerized natural Egyptian cotton with a matte finish. Using this thread in a project results in a soft, warm and natural look to your stitching. 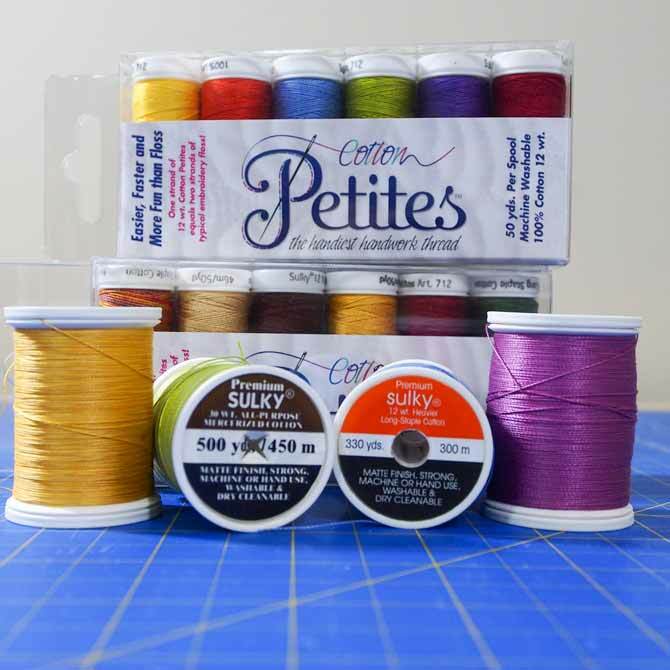 Sulky cotton thread comes in 2 different variations – solid colors which there are 126 different colors to choose from or 66 different variegated colors. Each of these solid colors and variegated colors come in either 30 weight or 12 weight. I’ve used the 30 weight a lot for quilting over the years and I have just recently started playing with the 12 weight thread. The threads come in 3 different sizes of spools ranging from a petite 50 yd spool to a 330 yd spool to a jumbo 2100 yd spool. They can be purchased as individual spools or in box set collections of coordinated colors. Use these threads for either hand stitching or machine stitching. Since I rarely do hand stitching I’ll be focusing on using them in the machine. The 12 weight thread gives a much more prominent look on the fabric than the 30 weight thread. It looks a lot like a pearl cotton and the up side of the 12 weight is that it can be used in the top of your sewing machine. With pearl cotton it usually has to be used in the bobbin for bobbin play and that’s a whole other topic. You can see the difference in the threads in picture below. The top is 12 weight while the bottom one is 30 weight. Here are a few tips that will help make life easier and your work looking wonderful when working with 12 weight thread. 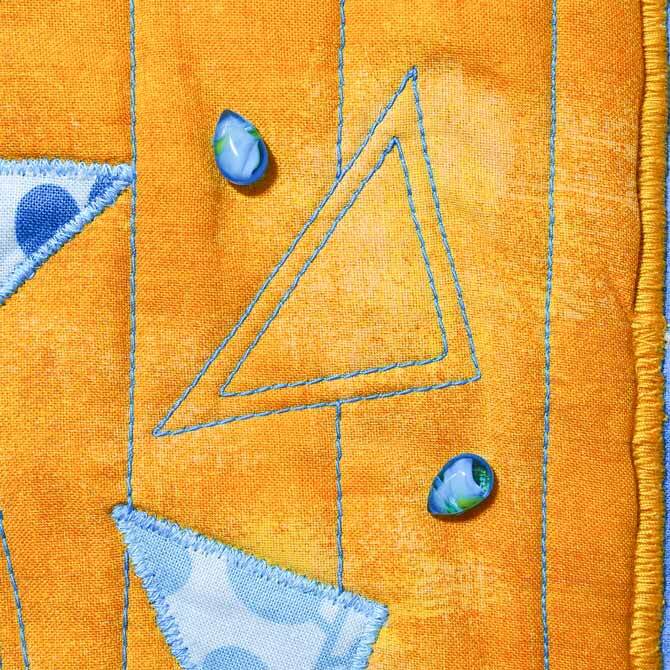 When sewing with the Sulky 12 weight thread use either a 14/90 or 16/100 quilting or topstitch needle. These needles have a larger eye and different shaped bevel at the tip to allow the thicker thread to stitch evenly and smoothly. 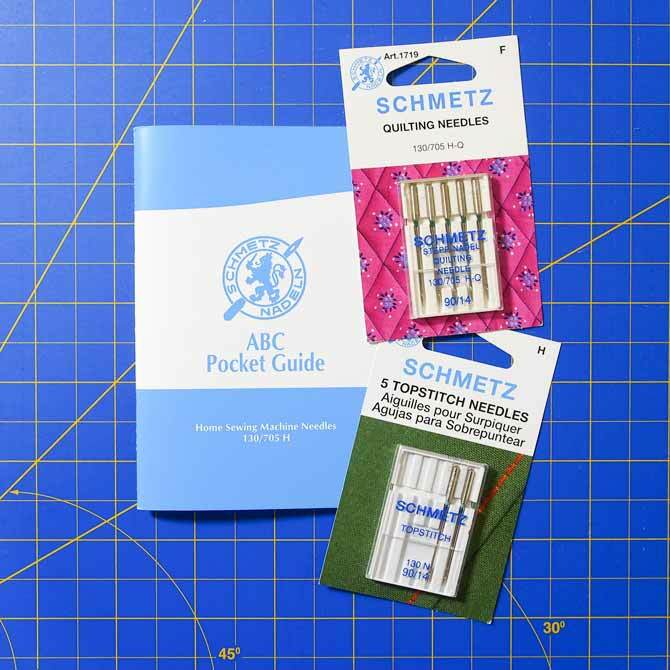 For more information about needles check out the Schmetz needle guide available at your local quilt shop. A 50 weight thread in the bobbin is what I find works best. I always use a cotton thread in the bobbin that matches the Sulky thread in color. 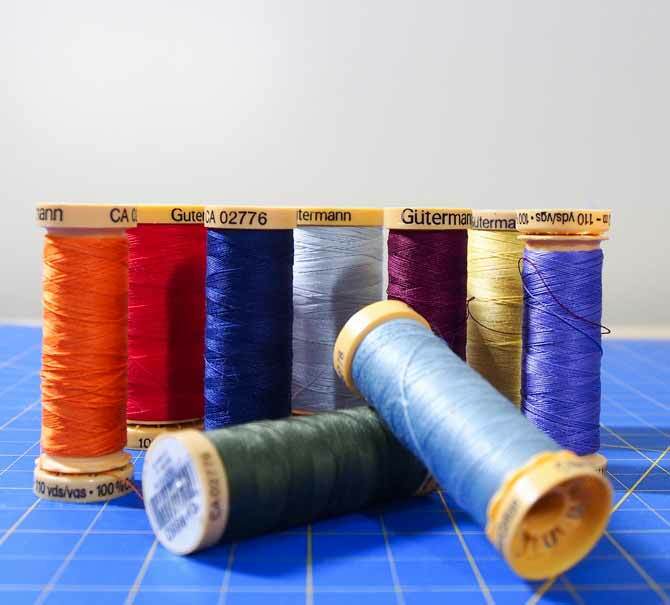 The Gutermann 50 weight cotton threads have such a huge range of colors that I never have an issue matching up a bobbin color with my top Sulky thread. Because you have a 50 weight thread in the bobbin and a 12 weight thread in the top of the machine there’s going to be a tension issue as the threads are not even weights. Changing the upper tension to get nice even stitches on the front and back of your work is a must. Don’t be afraid to play with the tension dial – it can always go back to where it was and it doesn’t hurt the machine to change the tension. Most computerized machines have an auto tension. This auto tension doesn’t necessarily correct the tension properly when using such diverse weights of thread so you may still have to set the tension manually to get a smooth and even set of stitches. 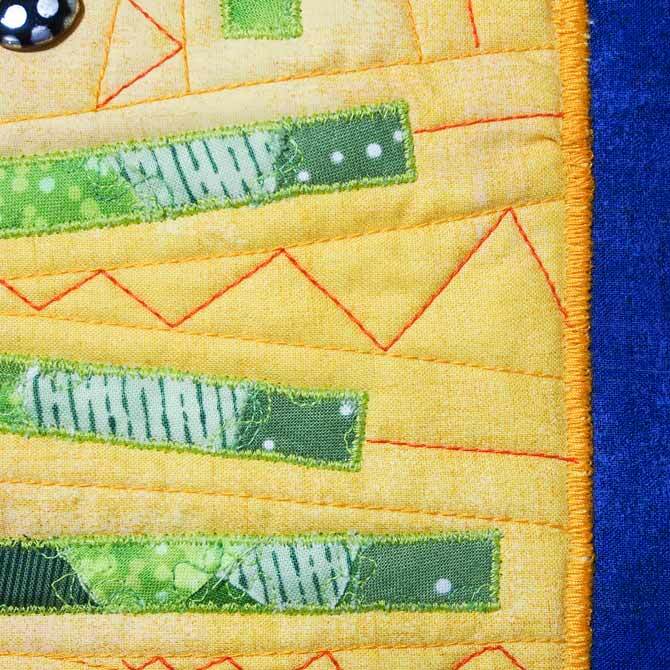 Each machine is different so make a little sandwich of the fabrics that are in your piece and do some test stitching. 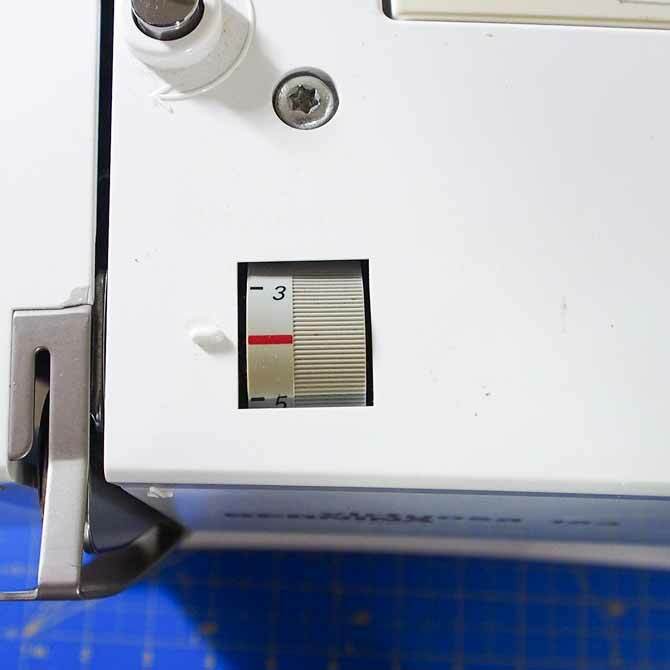 Change the tension setting for each test line and see what works best. When you’re happy with the stitches at a certain tension on your test sandwich then move onto your piece and start quilting. I have found that I like to increase the stitch length to 3.0 rather than the default setting of 2.5 that my machine automatically goes to. I found using the default stitch length the stitches looked crowded and chunky. The longer stitch length gives a much smoother and even look to the stitching. I have used the Sulky 12 weight thread for quilting with a walking foot and free motion foot – both have turned out beautifully. I hope that this will entice you to try different threads for your quilting and hopefully venture into the world of 12 weight Sulky. There are more than just the cottons in the Sulky range and many different weights in the whole thread line. Cotton is a great place to start with a different weight and a spool or package of thread makes a wonderful stocking stuffer. I’m pretty sure that any quilter would be thrilled to find one or two spools in her stocking on Christmas morning – I know I would be. On that note I’ll leave you with the 4 tips for quilting with Sulky 12 weight thread and see you next month. Hmm….looks like I better try this on my next project! Love trying new threads!! I love all the vibrant colours these threads are! These tips are awesome. The look of the sulky 12 weight thread is fabulous. But I am not an experienced quilter. It might be too soon for me to attempt to use it. Great tips! I am just learning to quilt and this information will come in handy. 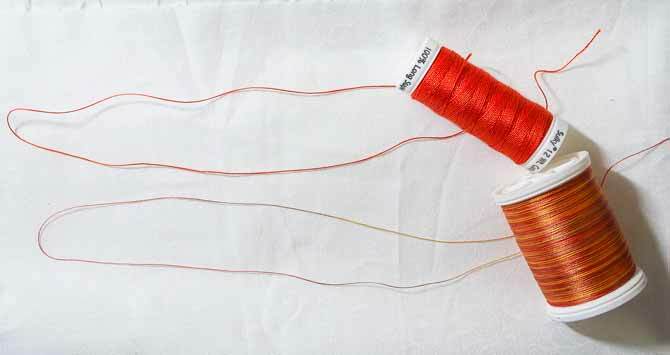 I love the look of the 12 weight thread, and these tips will get me started using it! I’ve been trying to come up with Christmas gift ideas for my sister-in-law, who makes and sells quilts. These would be perfect. Colourful and fab quality.